I have had a very chaotic last two years, and as a result have gone camping only four out of the last 760 days. I miss it. Quite dearly. I underestimated it’s therapeutic properties. But we have some hangups... We don’t have a legit camp/glamp vehicle. I felt... and this is ME talking here... that the longbed was once an exceptional camping vehicle. It was reliable, and half of the bed was still vacant after loading all gear. It was disposable, so you didn’t care about a little gravel. However, it’s three years later. We have a dog that won’t fit in the single cab with two bucket seats. Admittedly, I took it on some reeeeeally dicey gravel roads north of Skykomish... roads it should have never been on but the reward was the perfect campground so I have no regrets. My wife feels unsafe in the tin can and does not feel safe in it. She doesn’t like that she can’t drive it at all (my wife does not care for three pedals). Moreover, it’s become apparent the last two years or so: she’s getting old. We changed gears last time and took the Vibe. And MAN I did not care for it. We used every cubic inch of our 54 cubic feet of cargo space with the seats down and doggo crammed in somewhere. It was like a cartoon where the guy attempts to close the cargo hatch 50 times. Pushing on it, leaning on it, panting in exhaustion. The seats are okay, but are a total pain after 2 hours of driving. I told my wife I don’t want to take that thing again. 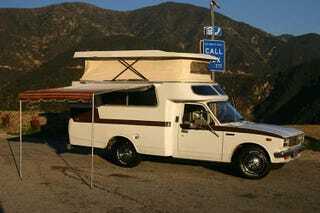 And while my IS is soooo sosososo enjoyable, it is the least glamp-worthy vehicle ever. No cargo, lowwwwww to the ground, RWD, and the inside is too clean and smells nice to abuse it with smelly camping torsos. And to complicate matters even further, I had hoped to replace the longbed with another... longbed! So I don’t quite know what to do yet... This is my internal debate that I expect to take two to five years to solve.